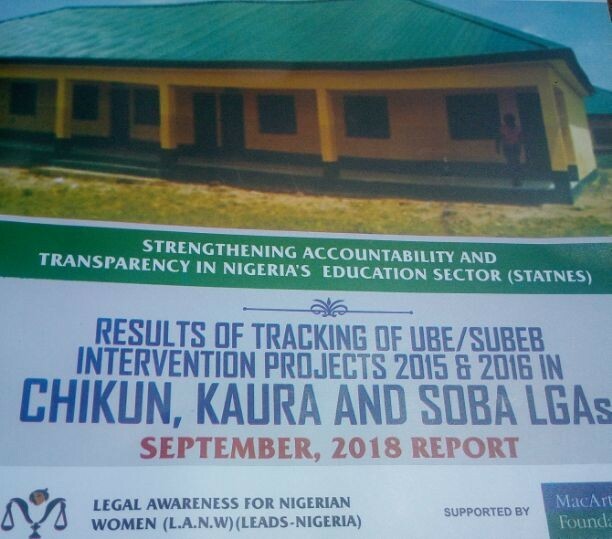 A non-governmental organisation tracking UBE/SUBEB intervention projects 2015/2016 in three local government areas of Kaduna State, Legal Awareness for Nigerian Women (LANW) also known as LEADS-Nigeria has suggested what critical stakeholder should do to enhance governance processes for quality service delivery. LANW with support from MacArthur Foundation is currently tracking education intervention project in Chikun, Kaura and Soba LGAs of Kaduna State under Strengthening Accountability And Transparency in Nigeria’s Education Sector (STATNES) project, and had already tracked 20 projects between November 2017 and October 2018. According to September 2018 report published by LANW, only a collective responsibility can guarantee expected results in public accountability – where each stakeholder must not fail in playing its role effectively. According to that report, State Universal Basic Education Board (SUBEB)/Local Government Education Authority (LGEA) must conduct regular and up-to-date NEEDS assessments of schools while soliciting community input from their community development charters (CDC) before allocating projects. SUBEB/LGEA should make available upon request the PPM department copies of bills of quantities to citizens to understand exactly what type of works or services are to be done under the respective projects. SUBEB/LGEA also need to liaise with the ES and respected benefitting school authorities to inform the school and host communities of the approval and take off of SUBEB projects and to introduce contractors to these stakeholders, among others. The LANW reported that, Ministry of Education (Kaduna State) must monitor to mitigate the consequences of rehabilitation work or use of some classes by the contractors which in such cases, the timetable will be distorted, pupils are squeezed into other classrooms or even stay off school. What contractors should do include but not limited to involvement of the youth and artisans of the host community in executing the work as a means of getting them meaningfully engaged and to provide a sense of ownership of the project. Contractors must also be ready to effect repairs as soon as pointed out and hold regular interface with the community for better understanding. KADPPA should publish details of procurement under the UBEC intervention project and blacklist any erring contractor who fails to comply with contract terms to serve as deterrent to others. Budget and Planning Commission/Ministry of Finance should at all times, facilitate quick releases for contractors upon compliance with procurement rules. As a citizen or a member of benefitting community of any public project, you must learn to enforce your rights and responsibilities by engaging government to understand your communal needs and follow up to track and give feedback on the implementation, as well as try to cooperate with the contractors handling the project. But before this report came out, in other to get all the stakeholders connected to achieve common goal, LANW embarked on capacity building training for them including the media. At the end of two day capacity building training for journalist earlier, the Executive Director, LANW, Barrister Rebecca noted that, a lot of interests were taken by the participants especially with regard to procurement processes in Kaduna State. People already asking for tracking of public works. “So we are discussing how best media practitioners can achieve this role in a durable way. Realistically, they can do this tracking on their own. But we want to see how we can be taking some of them to the sites when we are going to track these projects. “They already formed a social media group where they can meet to get this done better. We told them there is no funding from us, but they can always get funding from interested development partners to monitor how appropriated budget is being executed. “The two days meeting where we brought Media and partners including SUBEB and KADPPA that are tracking UBE projects in Kaduna state together went well and all of us are happy about that. We have been able to link these institutions with the media so they can work together to get things done better. “We had a very good response from KADPPA that they are willing to give them (Media) any information they have. One of the media practitioners was happy with website of KADPPA based on information he found therein. The linkage is now been strengthened because one of the key purposes of the meeting was to make the media understand the more as they dish out information the more people develop interest in governance. “The media people paid attention because they are interested and may be, because some of them have not attended these kind of meeting before. They stayed and participated very impressively. The selection too was possibly responsible for the turn out because we have the editors, reporters and producers among them and that is big plus for the success. “I expect the media would report more on this issues to sensitise people on the UBE funds and also track what they see as well as engage with institutions and get information on what they do. I just hope the relationship will continue to be good and the information success will not accuse the media of incorrect interpretation of reports”, she prayed.